Shoreline Fire honored an old Fire tradition on Monday - pushing the new ladder truck into its berth at the station before it goes into service. The tradition dates to the days of horse-drawn fire wagons. It was more feasible to push the wagons back into the stations than to train a team of horses to back up! Now it's only done the first time, when the apparatus goes to its first station. 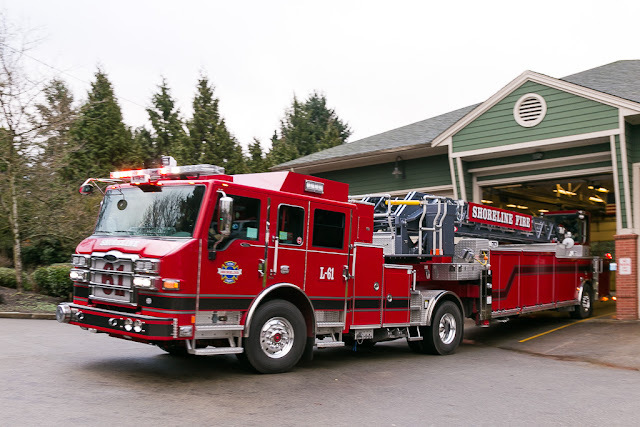 On Monday, January 22, 2018, firefighters and friends gathered at 8:30am to push the new ladder truck into Station 65 at 145 NE 155th St.
Fire Chief Matt Cowan explained the ceremony. Firefighters and one little boy put their backs into it to push the big apparatus into its berth. Firefighters were happy to show the features of the new truck. Lighted compartments will make it faster to get supplies. At 9:45am the first call came in and the new truck responded for a cardiovascular incident. Trucks are fully equipped and can do everything the vans do, except transport patients.